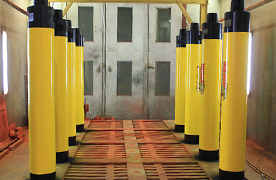 The Wildcat DTH Hammers are designed to maximize the usage of supplying compressed air flow, applied most efficient material for each parts, precisely machined by state-of-the-art CNC machines, heat treated in self own ultramodern facility and quality controlled by well-trained engineering experts. All processes of manufacturing of Wildcat hammers are carried out in self owned one factory. This guarantees that the best quality of the hammers should be maintained at all time. Increased drilling speed: Diminished internal friction by special heat treatment and precise work by ultramodern CNC machine. Deliver great energy to the piston by smooth air flow. Less vibration and smooth operation. : Wildcat DTH hammers are designed to help smooth air cycle to improve hammer performance. 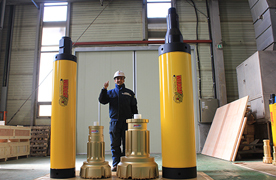 Applying the most effective material and heat treatment technology to each part, Wildcat hammers bring considerable durability consequence in wet and dry drilling condition. 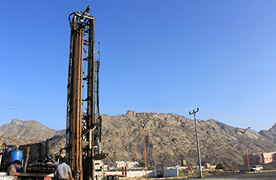 Wildcat provide wide range of hammers from 1” to 40”, for various kinds of drilling project such as water well, piling, tunneling, blast holes, geothermal, foundation, mining, earth anchoring and so on…. Copyright (c) 2017 KWANG-SUNG GM. All rights reserved.